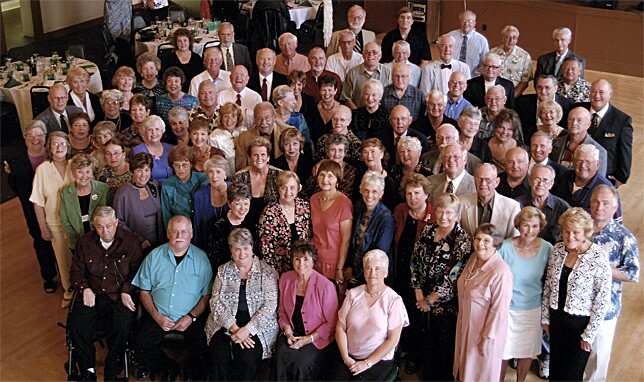 The Port Angeles High School Class of 1957 had our 50th Class reunion in Port Angeles on August 17th and 18th, 2007. Friday the 17th we met at the Golf Course Club House for cocktails and talk – getting caught up on the last 5 years and what happened to whom and when it happened. Golf games took place for those who wanted to play on Saturday the 18th. By the way, it would be great if any of you guys and gals who played that day would write in and describe the fun you had similar to the way the stories were related the night of the dinner! You made us all wish we had been there just to watch, if nothing else! Saturday evening we met at the Elks Club downtown. The wonderful buffet dinner was enjoyed by all, followed by an award ceremony pertaining to those infamous golf games we heard so much about. There were lots of memories and laughs, talking, eating and drinking, and delight in the fact that so many of us were back for another year! During the evening, Suzie U’ren Nichols, who has worked so hard over the years and has been the driving force responsible for all the reunions we have had to date, informed us that she would not be able to continue in this capacity and that this was the last reunion she would be able to organize. Several of us quickly got together and said we would keep it going – and offered lots of help to each other to do so. Thank you, Suzie, for all your hard work. You have done an incredible job over the years and we will always be grateful for your dedication! We will be keeping in touch with as many of you as we can, in as many different ways as we can. We will rely heavily on this website, but will also send out mailings via the U.S. Postal Service, so please everyone – check your profile to make sure we have your correct contact information. This website is the most powerful tool we have to keep in touch, so please – if you know someone who hasn’t joined yet, send them to the site! It is a wonderful way to give everyone a chance to provide their own input and to keep everyone informed as to what future plans might be.